My friend's friend is getting married and I have been requisitioned to brew a special batch of beer for groomsman gifts. Since these are going to be gifts, I thought I'd go beyond filling reused bottles with various labels half torn off, and spend an extra buck or two for added class. 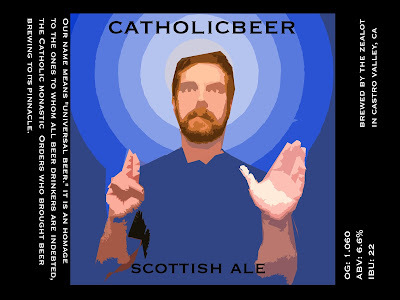 I ordered labels (seen above) and bottlecaps (featuring the catholicbeer cross). I figured they would be received better if they were dressed like sophisticates rather than ragamuffins. I will certainly post some pics when they are fully clothed. Anyone else needing home-manufactured libations for social gatherings can give me an e-ring. Such zeal. I am very pleased.